What a difference a month – give or take – can make. 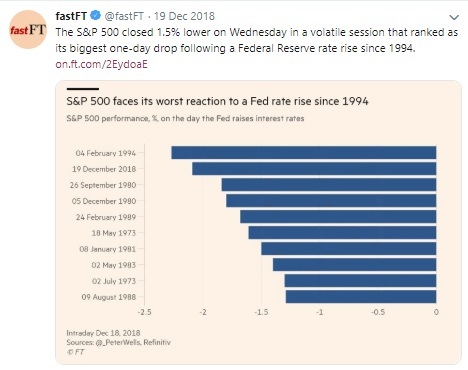 In December, the Federal Reserve (Fed) raised the Fed Funds rate 25 basis points (think of a basis point as cents are to a dollar) to a range of 2.25% to 2.50% and the market promptly sold off a lot, see the Financial Times image below. While that rate increase was expected, it was the post-December Fed meeting press conference by Chairman Jay Powell that spooked investors as Powell indicated that the Fed was on a pre-determined path concerning interest rate increases and the ongoing shrinking of its balance sheet, regardless of market volatility and economic uncertainty. As an aside, the Fed’s balance sheet grew significantly during the Great Recession due to an undertaking known as Quantitative Easing/”QE,” where the Fed purchased trillions of dollars of bonds in the hope of stimulating the economy. Now that the economy is on much firmer footing, the Fed has been shrinking its balance sheet, an undertaking known as Quantitative Tightening/”QT.” Most economists believe QT will prove restrictive to economic growth. 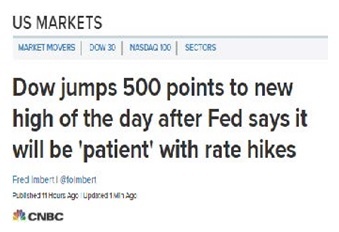 Well, the Fed met again last week and is now singing a different tune. Specifically, the Fed is promising a much more patient, data dependent approach to both future interest rate increases and balance sheet management. The stock market clearly welcomed this gradualist approach, moving sharply higher on January 30, per the CNBC headline. We have seen monetary policy risk – the danger of the Fed raising rates too far, too fast and sparks a recession – as one of two meaningful risks to the economy and markets this year. We now seem to be solving for monetary policy risk, and we do believe the Fed’s more patient, deliberate approach is appropriate. If we can solve for the other meaningful risk to the economy and markets, mainly US/China trade, we should see a boost to both consumer and corporate sentiment and spending. We do expect good news on the trade front soon, and we remain cautiously optimistic on the US economy and US equities into 2019. Hard to believe, but the calendar has turned on another year. And for those of a certain age, it’s even harder to believe we are living in 2019; after all The Blues Brothers was released in 1980! On top of the calendar shock, we have to contend with the fact that 2018 didn’t seem all that great. From an investing perspective, most asset classes were in the red, while the S&P 500 Index (S&P 500) was exceptionally volatile toward year-end and produced its worst total return in 10 years. And, from a political, societal, and cultural perspective, the US seemed more divided than ever. As always, a bit of perspective is important. The S&P 500 was off less than 5% in 2018 on a total return basis and remains 16.5% higher over the past two years. Meanwhile, the US economy grew 3%+ in 2018 while our unemployment rate sits at just 3.9% and most measures of national wealth and health are at a record high. So, while we must periodically contend with market drawdowns and bouts of economic weakness, it’s important to remember that over time, most economies grow, risk assets increase in value, and the standard of living for all of us on this big blue marble improves. To put that final point in sharper relief we have two interesting charts from Our World in Data. 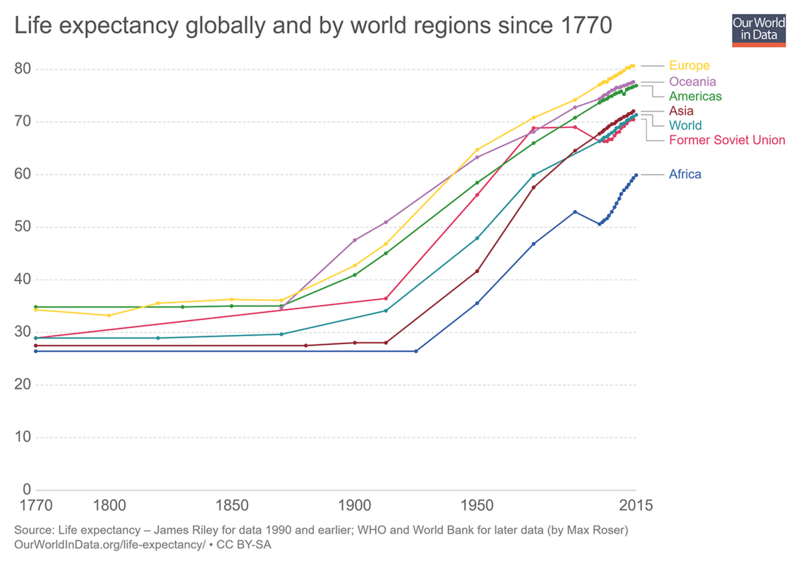 The first chart speaks to the dramatic increase in life expectancy since 1900, with Africa seeing a particularly significant jump from 50 years in 2000 to 60 years in 2017. 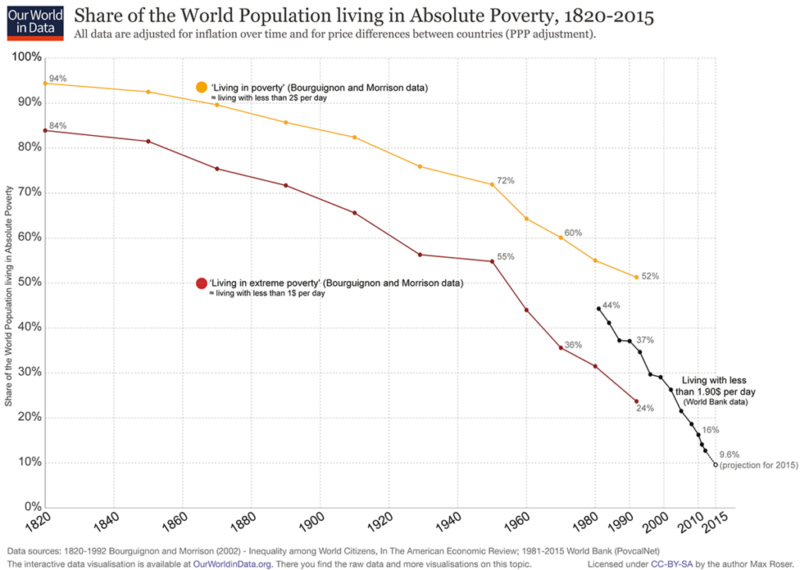 While the second chart, below, speaks to an almost unfathomable drop in global poverty, with less than 10% of the world’s population living in absolute poverty today compared with 44% in 1981. The new year will likely present its share of challenges and setbacks, yet, if history is any guide, we will see economic growth and rising asset values and wealth created globally. Is Brinker Capital still optimistic on the US economy and US equities? To answer both questions, we remain optimistic on the US economy and markets into 2019. We are overweight US and emerging market equities and conservatively positioned within fixed income, as we continue to see interest rates biased higher. Additionally, we remain optimistic as the fundamental data continue to point us in that direction. The US economy should grow north of 3% in 2018 and about 2.5% in 2019. We see very little risk of a recession in the new year. US corporate profits should grow north of 20% in 2018 and mid to high single digits in 2019. Continued growth in earnings is important for a few reasons, including the fact that we haven’t had an economic recession without an earnings recession (e.g. when US corporate profits decline year-on-year) and that as earnings move higher and the market trades down, stocks become more attractively valued. None of the classic indicators of a recession, including an inverted yield curve, restrictive monetary policy, or a rolling over of leading economic indicators are present today. In fact, one could argue that the US economy is doing exceptionally well, with unemployment below 4%, GDP growth above 3% and inflation anchored near 2%. Also, the recent dramatic drop in the price of oil will translate into lower prices at the pump for US drivers, a powerful economic tailwind when considering our economy is 70% consumer driven. Pivoting back to the US equities, not only is the market attractively valued at below 14x forward earnings, 2018 should see US companies pay a record amount of dividends and buy in a record amount of their own shares. Both are important pillars of support for stocks. Many measures of Investor Sentiment are at or close to all-time high levels of pessimism. This indicated that many investors have capitulated and return expectations moving forward are very low. In this environment, news that is even incrementally positive can have a substantial upside impact on markets. So, if the fundamental data is so robust, why has the market been so volatile and biased lower? We would point to two primary concerns. First, the US Federal Reserve (Fed) is pushing interest rates too high too quickly, which will ultimately lead to a slowing of corporate and consumer spending and a recession. Second, the US and China won’t be able to resolve their differences on trade, with escalating tariffs ultimately pushing the Chinese economy into a recession, which will pull down global growth and possibly cause a recession here at home. We believe both risks are real and meaningful, however, we also continue to believe that the Fed will move quite slowly on interest rates next year and that cooler heads will prevail on trade. In fact, the Fed has made it quite clear they will be data dependent when it comes to interest rate policy in 2019 and the US and China recently agreed not to impose any additional tariffs during a 90-day negotiating period. We expect good news on the trade front sooner rather than later. Market drawdowns are never pleasant, but they do happen. And when markets sell off it is important to keep one’s focus on the fundamentals and away from the media’s bias toward fear-mongering and frightening headlines. Today, the fundamental underpinnings of both the economy and market remain robust and as a result, we remain optimistic on both into 2019. Tim discusses the recent drawdown in US equities and the associated volatility. Since October 1st, the S&P 500 is off approximately 9% while also experiencing two intra-period rallies of approximately 6%. While both trade and monetary policy are legitimate concerns for the market into year end, we continue to believe that cooler heads will prevail concerning the US / China trade dynamic and that the US Federal Reserve will move cautiously on interest rates in the new year. Brinker Capital remains constructive on the US economy and US equities into year end. Tim discusses the often used Wall Street adage “sell in May and go away,” which cleverly lets the listener know that returns provided by US equities have historically exhibited a seasonal pattern. US equities have historically exhibited a seasonal pattern, with the months of May, June, July, August, September and October underperforming the months of November, December, January, February, March and April. So far this November, historical patterns haven’t held with the S&P 500; as of this recording, off about 1% on a total return basis month to date. Seasonal patterns aside, we remain constructive on US equities. On this week’s podcast (recorded November 9, 2018), Leigh provides a brief review of the October markets. It was a rough start to the fourth quarter as increasing concerns over the “wall of worry” led to risk assets suffering a sharp drawdown in October. Despite these negatives, US fundamentals remained solid with third quarter US real GDP growth coming in at 3.5% and unemployment at a record low. Developed international equities, as measured by the MSCI EAFE Index, were down -8.0% for the month and -8.9% year to date. The Bloomberg Barclays US Aggregate Index was down -0.8% for the month and is down -2.4% year to date. Despite the October sell-off in equity markets, we remain positive on risk assets over the intermediate term. Listen to the abbreviated audio recording. Read the full November Market and Economic Outlook.